Choosing safety equipment is always an important concern. If you own a business in Australia, you have likely already considered putting in fire prevention devices. If you have a sprinkler system or are considering buying a new system, you need to make sure that every part pulls its weight. While you have likely spent some time thinking about sprinkler placement and how large of a tank you might need, you may not have thought about fire pumps. These pumps are integral to the system itself, yet are often forgotten. If you want to keep your business safe from fire, though, these pumps require your attention. 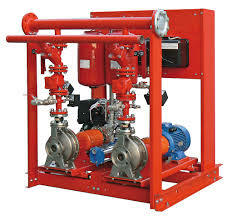 Fire pumps are an important part of the fire-prevention safety mechanism. This is the part of the fire sprinkler system that moves the water from the water tank to the sprinkler heads, delivering water at high pressure so that it can put out a fire. Without a pump, it would be impossible for water to be delivered to overhead sprinklers when the tank was stored at a lower elevation. In fact, one can safely say that the pump is the most important part of the operation – when the pump does not work, the entire system will go down. As a piece of industrial technology, it is always important that your fire pumps meet the relevant industry and national standards. Be aware that while many pumps are made to meet Australian national standards, your particular industry might call for something that is above and beyond the national requirements. You want to make sure that your pumps give you exactly what you need when you need it, so make sure that they follow the standards set by others. Making the choice to install a fire pump that conforms to Australian and industrial standards will help to keep you out of trouble with the law and will keep your business safer. The eternal question when it comes to fire pumps is whether you should choose diesel or electric. In reality, there is no right answer – both sides of the argument are quite valid. Diesel proponents will state that their preferred power source is more reliable, while electric proponents will point to a lower overall cost when one considers maintenance and fuel. Picking the right pump is going to be a matter of determining what your business can afford and what it needs to conform to the relevant codes. The best way to make sure that you get the right fire pumps is to buy them from a supplier that you can trust, such as Aline Pumps (http://www.alinepumps.com/)A supplier that can do custom work that is up to Australian standards is always your best bet, as such a company will make sure that your pumps are specifically fit for your needs. If you want to keep your business safe and you want to make sure that you are following all of the nation’s safety standards, look into purchasing a high quality fire pump.